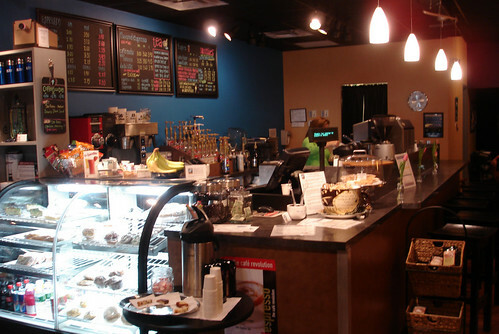 This past weekend my wife and I headed out Friday night to check out the Electric Beanz Coffee Bar located in Raleigh (near Garner) next to the Harris Teeter in the Kings Grant shopping center at the intersection of Ten-Ten Road and 401. 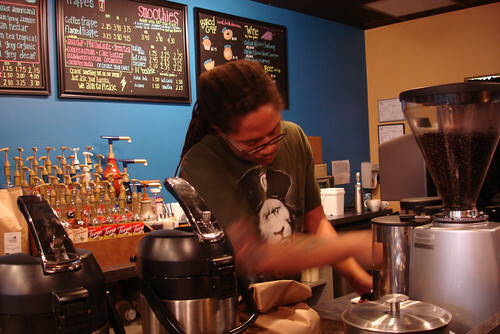 This is a really cool coffee bar with a neighborhood vibe. 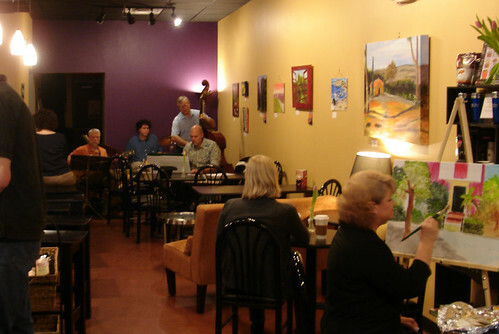 They participant in a local event called “Art after Dark (http://www.thenatureofartframeshop.com/art_afterdark_details.html - broken link)” where on the second Friday of each month they feature the work of local artists and have live jazz music. 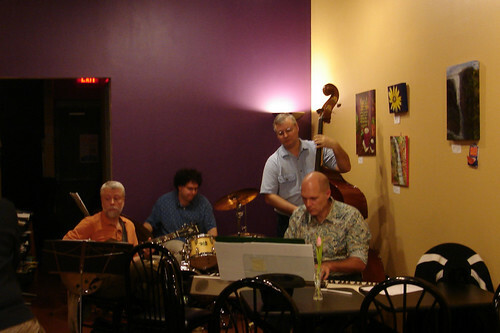 Theya also feature other local musicians on a regular basis, hold poetry readings, and even offers teen open mic nights for budding musicians. The coffee is organic, fair trade, and we found it to be excellent. 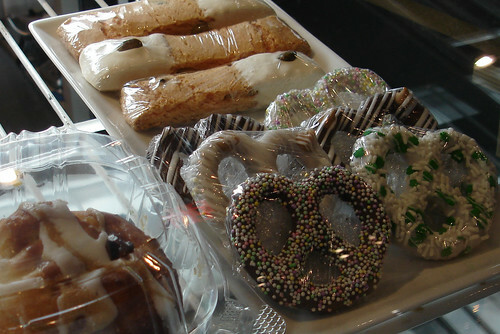 They also have free wi-fi and offer fruit smoothies and lots of baked goods from local bakeries including a gluten free cheesecake. 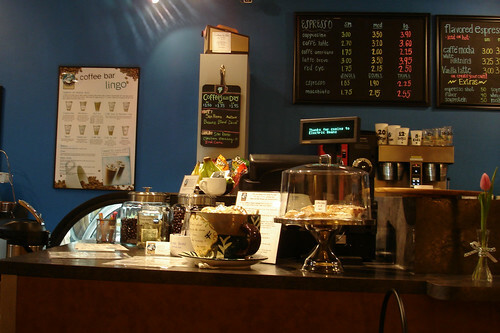 I really wish this coffee bar was located in North Raleigh! 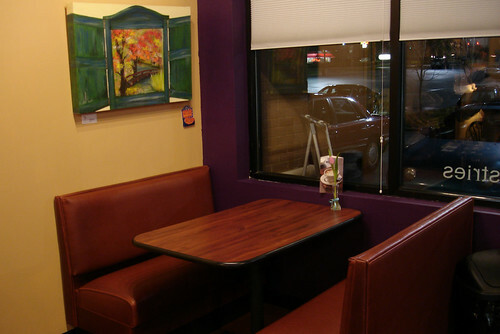 We could use a nice local place like this! I highly recommend you check them out if you live in that area. Here are a few quick pictures from my visit. Thanks for the tip NRG. 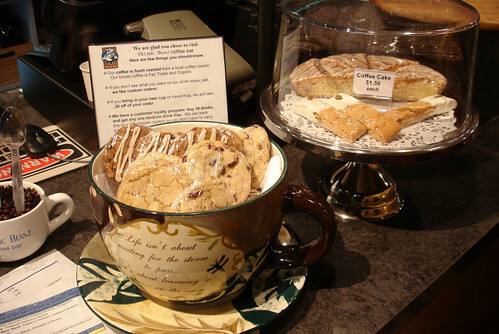 This place is only a mile or 2 from my house, and we are in that Harris Teeter every Sunday morning, but we've never been to this coffee shop. . . . . . maybe because my wife and I don't drink coffee. But, now that I know they have smoothies and gluten free cheesecake, perhaps we'll stop in some evening. 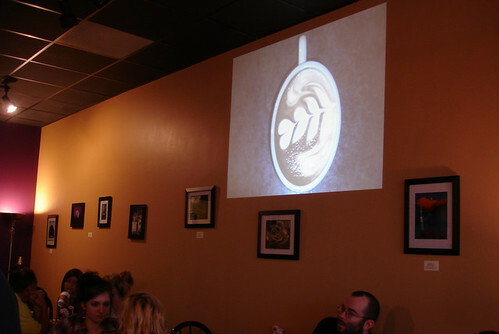 I was back at Electric Beanz last night to check out their "Latte Art Throwdown". 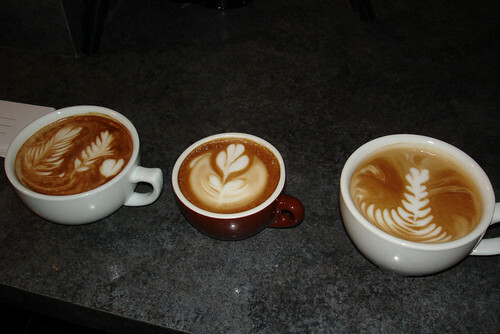 Baristas competed head-to-head to see who could pour the best latte art (steamed milk poured into espresso to create designs). Oh, and Guess what? They now serve wine and beer too. The have Fuquay's own Aviator on tap. Had me a pint. It was excellent! 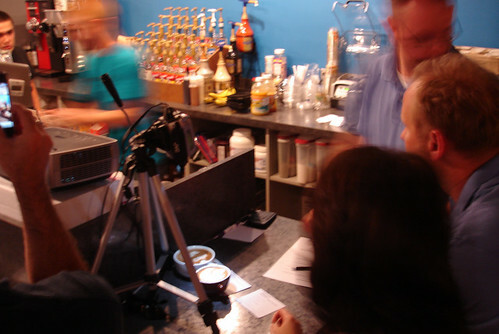 Some pics from the Latte Art Throwdown! 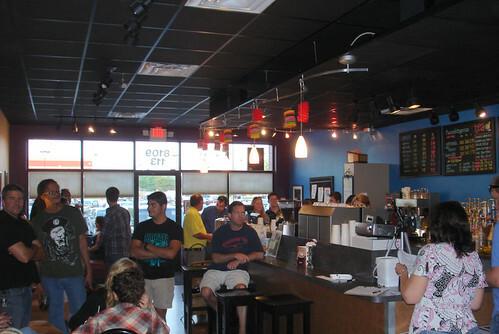 Made anohter trip to Electric Beanz last night to perform at their Open Mic Night. They have music most weekends too. Check out their website for the schedule of events. I had two excellent pints of Aviator beer on this visit. 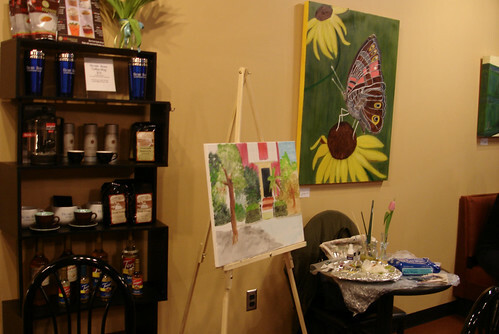 Hope to go back soon and enjoy some coffee. 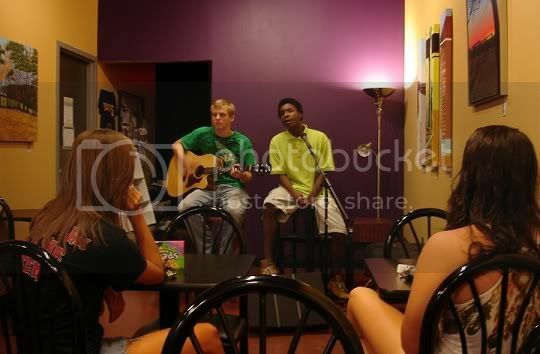 Here are two quick pics from the Open Mic. 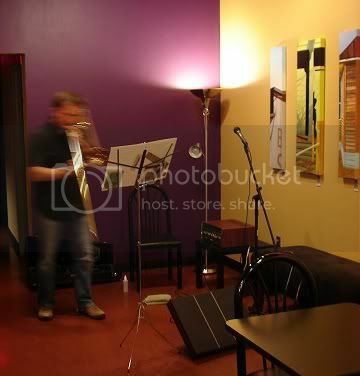 The "Unknown Trombonist" - So fast with the slide he is blurry! These two guys had some great original material! Thanks! It is quite a skill now isn't it! 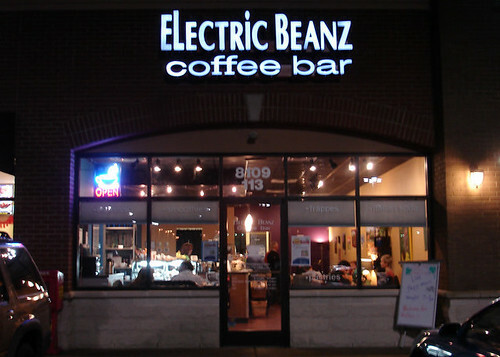 I just heard a rumor that Electric Beanz is going out of business. I found out because they were looking to sell their BeverageAir commercial kegerator, and news like that gets around a beer club pretty fast. Actually they just changed ownership yesterday (2/3/12). I got an email from the owner who is a friend announcing they sold the business. I am very sad to hear this news , but my understanding is they plan to carry the same coffee and employ the same baristas. Not sure if the name will change. Perhaps based on your news they will no longer offer beer? If they opened a location in the Cary Trader Joe's shopping center my wallet would be in trouble. Thanks for sharing this. I love coffee shops and of course, coffee.